In the second chapter of WTOP's Voter Voices series, Howard County voters speak about their concerns, priorities and what's on their mind as the governor's race fast approaches. This story is part of the series, “Voter Voices.” WTOP asked voters across Maryland what issues concerned them, and who would be getting their vote in the upcoming election for governor. Other chapters have included stops in Montgomery County, Baltimore City, Frederick County, and Prince George’s and Calvert counties. HOWARD COUNTY, Md. — Election Day is now less than a month away. How is the closely watched race for governor between popular Republican Gov. Larry Hogan and Democratic challenger Ben Jealous shaping up in Howard County — one of Maryland’s traditional “tossup” counties. From the Mall in Columbia, to the sidewalk outside an Ellicott City tattoo parlor, WTOP asked voters in Howard County about their concerns and priorities in the last few weeks of a contentious race for the governor’s mansion. Hogan continues to tout his administration’s accomplishments. On Wednesday, Hogan appeared with students from across Maryland while announcing a statewide tip line designed to alert officials to potential school violence. Jealous, has enlisted some star power in his campaign: appearing with comedian and actor Dave Chappelle in a series of campaign events. Howard County is often considered a swing state and a “bellwether” by political analysts — a place to help gauge which way the tide is turning across the state as a whole. While registered Democrats outnumber Republicans, the county currently has a Republican county executive, who is running for re-election. “Kittleman is polling in a manner similar to how Hogan is polling statewide — suggesting that Howard County may be that bellwether again this time around,” said Todd Eberly, associate professor of political science at St. Mary’s College of Maryland. Bruce DePuyt, senior reporter with Maryland Matters, said “Howard County has a very similar voter profile to Montgomery County; highly educated, very affluent.” Like Montgomery County residents, DePuyt said Howard County residents tend to put education at the top of their list of priorities for local government. And like their neighbors in Montgomery County, they are concerned with transportation. “Many people who live in Howard County commute to a job either north to Baltimore or south to Washington. Either way they’ve got a challenge,” with commutes that can leave them sitting in traffic — but many find the commute worth it. A lot has been written about how voters are turned off by the current political climate, but that’s not true for two of the Howard County residents who talked about the upcoming election with WTOP. ‘Pie in the sky’ promises or goals to strive for? 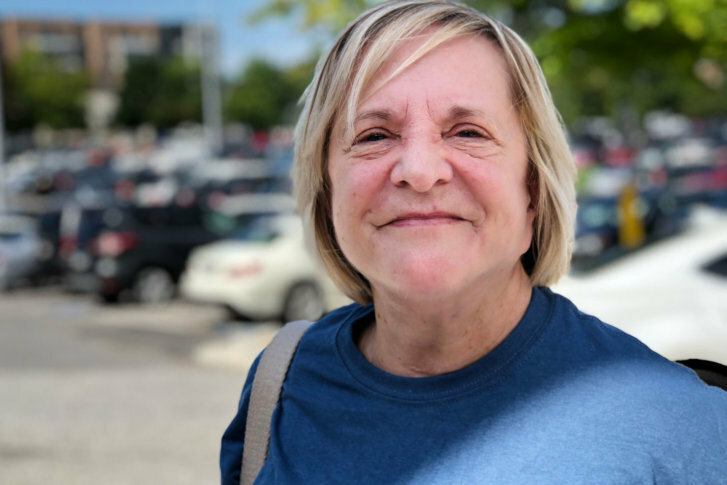 Jeanette Simpson, an Ellicott City resident, was out shopping with her daughter at the Mall in Columbia when she was asked about her concerns in the governor’s race. She cited pollution, the environment and schools as her key issues. She’s also keeping a keen eye on education funding. “I’m a Democrat by nature, but I — surprisingly — have liked Hogan,” she said. “He has not been what I would consider — what I would classify — as a standard ‘Republican’ candidate,” she said. “He has a reasonable track record for me, but I’m inclined toward Democratic issues.” She said she’s got some more research to do. Outside the Ghost Town Tattoo parlor in Ellicott City, Gabriella Fiorino and Connor Brown talked about their concerns. Fiorino attends the University of Maryland, Baltimore County and is preparing for a career in early childhood education. She said she is concerned about low teacher salaries, referring to how teachers often use money from their own pocket to make sure their classrooms have adequate supplies. Democrat Ben Jealous has suggested coming up with a fund to reimburse teachers for those expenses. But Fiorino, an unaffiliated voter, also wants the next governor to focus on small businesses. She said she wishes people would cross the political divide more often. “Nowadays, politics is more about an argument than a conversation,” she said. Brown, who also attends UMBC, said he isn’t up to speed on who’s on the ballot right now, but is certain that education and transportation matter the most to him. “I know I drive my car on a lot of very bad roads.” He said he’s hoping for a governor who will pour more money into transportation. For him, that’s roads, but he said he’s got a lot of friends who take public transportation to school.